Golden Artist Colors has forged unique relationships with artists for decades. Paints, mediums, varnishes, application techniques and archival practices have been explored and developed in collaboration with artists around the world. The opportunity to exhibit some of the works of these artists and collaborations came to fruition when on Sunday, September 13, 2009 the Sam & Adele Golden Gallery (SAGG) was inaugurated with ‘Darryl Hughto: Diamonds,’ an exhibition of eleven paintings created by painter Hughto from 1975 to 1979. The 2,500 square foot SAGG is located at Golden Artist Colors, Inc. in New Berlin, NY, within the campus that houses the GOLDEN offices, manufacturing facility and the Sam & Adele Golden FoundationSM for the Arts office and just several 100 yards from the Sam & Adele Golden Foundation Residency Barn, now under construction and slated for completion in summer of 2011. The SAGG is open to the public and will feature a revolving schedule of curated exhibitions. A virtual tour of SAGG exhibitions as well as essays about the artworks and exhibitors’ resumes will be presented on a dedicated Web site: http://www.theSAGG.org. All of the SAGG exhibitions will be archived on the Web site for reference in the future. The mission of the Sam & Adele Golden Gallery is the exhibition and presentation of artworks that focus on the explorations and investigations by artists of the painting media of the 20th and 21st centuries. The SAGG is not a commercial venue. The curatorial function of SAGG seeks to cast light upon artists’ methods, points of view and achievements. In 1999 the Sam & Adele Golden Foundation for the Arts was formed as, ‘a meaningful resource for the professional visual artist’ and as a way ‘to thank the community of artists for their support, encouragement and friendship.’ The Foundation’s ongoing programs reflect the connection that Sam and Adele shared with artists. The SAGG will enable a parallel focus on their legacy. Over the course of several building expansions since the formation of Golden Artist Colors, the exhibition of original artworks at the GOLDEN facility has grown from hanging artworks in common areas, individual offices and a conference room, to the newly dedicated space of the SAGG. A visitor to the GOLDEN plant might wait for a few moments in the reception area with Larry Poons’ 1986 painting, “Affetso” and soon find themselves in another part of the building with works by Dale Chihuly or Frank Stella on the wall. The opportunity to experience and to be challenged by a wide range of artist’s works has been a critical component of employment at Golden Artist Colors. The heart and soul of the corporate endeavor has not been simply and only the manufacturing of paints but has been concerned with advancing every aspect of the artistic endeavor — whether technically through education or research. Golden Artist Colors has led the art materials industry by active example, by listening to artists’ needs and translating them into usable products and expanding the vocabulary of tools. This inclination, to go beyond the corporate function of solely manufacturing, has led to the eventual outreach through several pre-SAGG exhibitions. In 1992 the first curated exhibition titled ‘For the Seventh Generation: Native American Artists Counter the Quincentenary, Columbus, New York’ was mounted. Curated by artist Phil Young and supported by grants from New York State Council on the Arts, the Chenango Arts Council and GOLDEN, the exhibition featured 16 Native American artists and marked the Quincentenary of Christopher Columbus’ appearance on the continent by positing an alternative view. In 2000 the first Silent Auction on behalf of the Sam & Adele Golden Foundation for the Arts was held with nearly 70 works offered and the proceeds of that auction enabled support for a number of individual artist grants and support for several dozen arts organizations including Triangle, Womens Studio Workshop, Art Omi, Change, and many others. 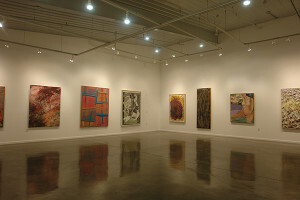 By 2006 construction had been completed on a facility expansion at GOLDEN and on July 12, 2007, Golden Artist Colors officially opened its Gallery’s doors. The inaugural show, “A Gathering of Friends,” told the stories of some of the early supporters and friends of the Golden family. Artwork featured in the show included works by Larry Poons, Paul Jenkins, Dale Chihuly, Jules Olitski, and John Griefen, just to name a few. The artwork marked not only specific milestones in the company’s history, but conversations between the artists and company founders Sam and Mark Golden throughout the past 29 years. 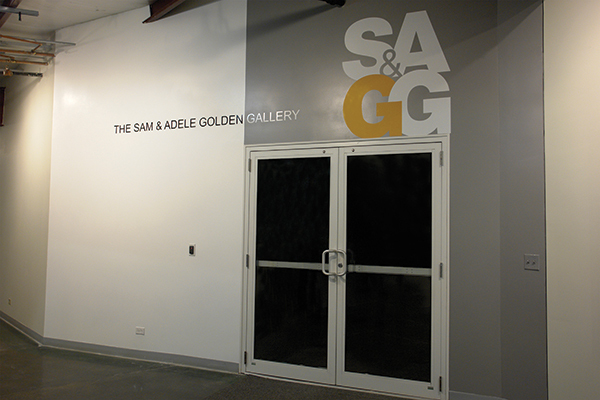 Later that same year, the second Silent Auction on behalf of the Sam & Adele Golden Foundation was held in the gallery space that was in 2009 to become the SAGG. In this Silent Auction the number of works offered swelled to 150 and for the first time, the auction was viewable on the Internet. On September 13, ‘Darryl Hughto: Diamonds’ opened as the first exhibition presented in the newly named Sam & Adele Golden Gallery. The works in the exhibition were created thirty years ago when Hughto explored this series of abstract paintings combining raw canvas stained with liquid acrylic and thicker paint applications in an unique synthesis that explored how format, in this case a diamond shape within a rectangle, could liberate drawing and color in painting. This focused chapter in Hughto’s development presents him as an unmistakable, expressive and strongly independent artistic voice, a voice that continues to innovate to this day. SAGG joins the other esteemed viewing spaces of Central NY: Everson Museum of Art, Syracuse; Munson Williams Proctor Arts Institute, Utica; Schweinfurth Memorial Gallery of Art, Auburn; Picker Gallery at Colgate University in Hamilton, and the galleries at Hartwick College, SUCO, UCCCA, and Earlville Opera House, all of which contribute not only to a vital local arts community but are linked to the rest of the art world. Noticeably, the SAGG has been inaugurated during the most dire financial crisis in generations. To do so, to have allocated resources to initiate a program of exhibitions underscores the commitment that Golden Artist Colors has always maintained with artists. Visitors will find that the immediate landscape outside of the SAGG is the verdant, pastoral environs of Central NY where the landscape and varying cloud cover are their own unformalized and powerful aesthetic. And inside the SAGG is a fabulous gallery space that physically could be anywhere in the world: New York, London, Berlin, but as would happen, can only work its own particular magic from right where it is!